Tue, October 2, 2018 9:00 A.M. Your Board of Directors is a critical internal audience, yet too often, Board Members may have a limited understanding of their nonprofit's unique brand attributes, positioning, or messaging. And sometimes, it can be difficult to explain the value of new marketing ideas and outreach activities. How can Board and staff work together to grow audiences andfundraising dollars? Join us for our October Panel, where we'll showcase nonprofits that have successfully empowered Board Members to become enthusiastic Brand Advocates and active ambassadors that engage new audiences! We'll dig into real-world case studies so that attendees can learn what works (and what to avoid!) from some of Philly's top nonprofit leaders. Join us for coffee and conversations with Philadelphia's nonprofit movers and shakers! In partnership with the Regional Foundation Center. 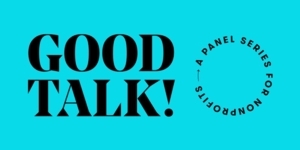 For more information on upcoming Good Talk! sessions, visit j2made.com.